SPIRIT 1 & 2 – situated on the roof of the School of Physics at The University of Western Australia under the skies of the city of Perth. 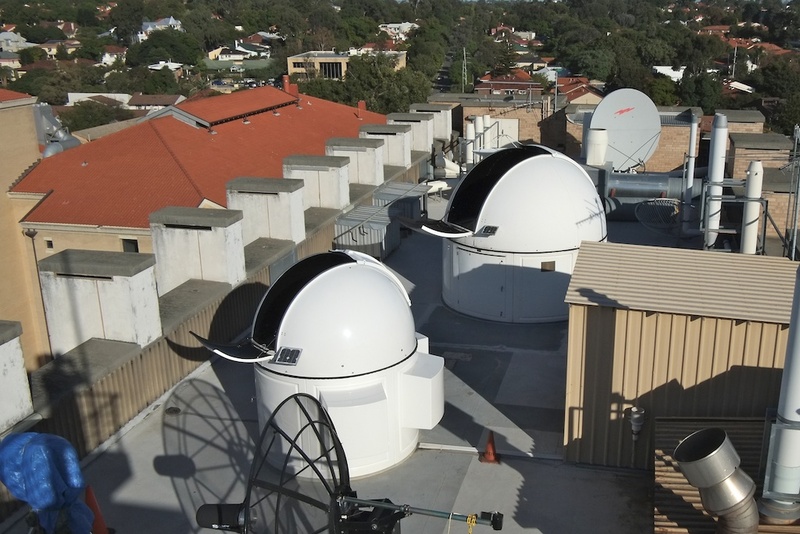 SPIRIT 1 & 2 Observatories at UWA’s Crawley Campus. SPIRIT 3 & 4. Hosted at UWA’s Zadko Observatory 1 hour north of Perth. 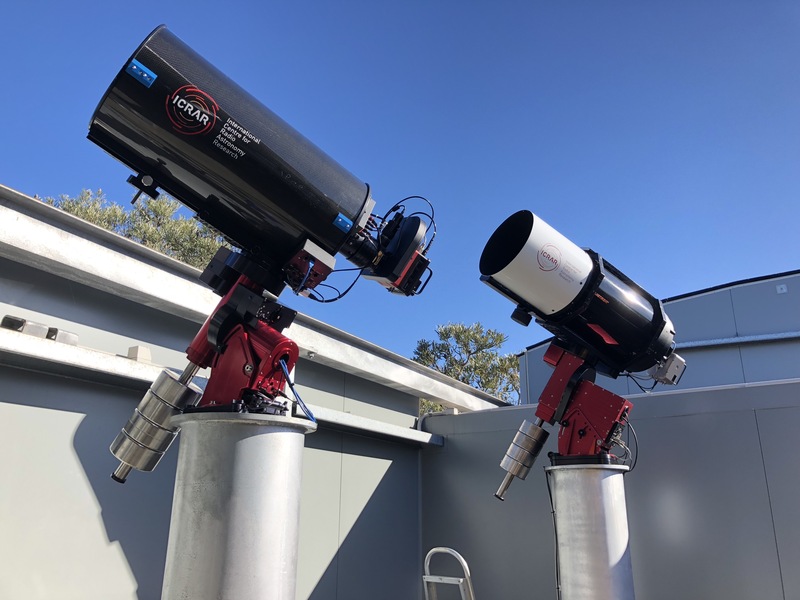 SPIRIT 3 & 4 at UWA’s Zadko Observatory, Gingin. Access to SPIRIT is provided free to authorised teachers, students and researchers according to the information and processes provided elsewhere on this web site. The SPIRIT initiative incorporates a full life-cycle of teacher and student professional learning opportunities and activities delivered via the outreach program at the International Centre for Radio Astronomy Research. 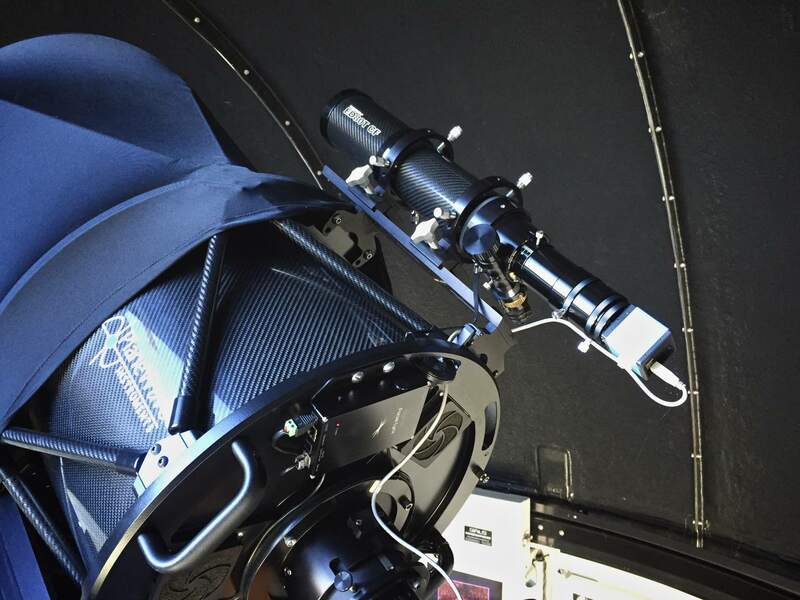 SPIRIT 1 is a 35cm Schmidt-Cassegrain telescope manufactured by Celestron Telescopes. 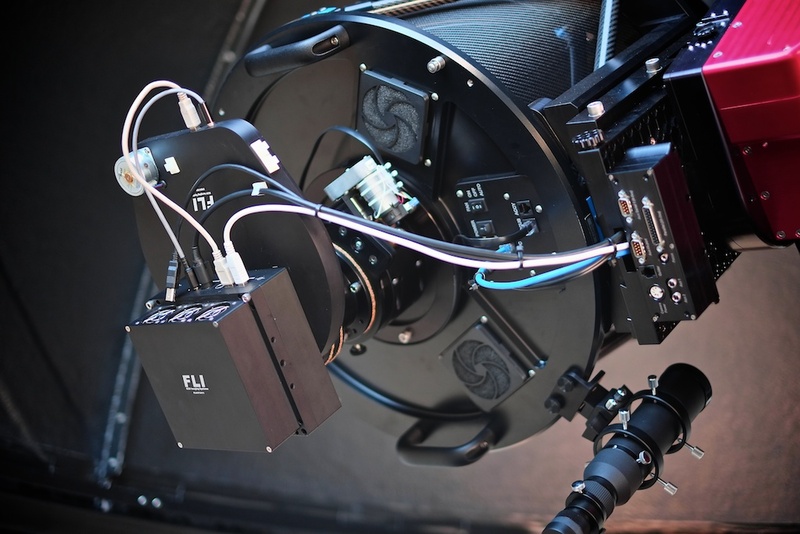 Its imaging camera is an Apogee Alta U6, which provides a 20 arc minute square field of view, and a default resolution of 1.2 arc seconds per pixel. The aluminium tube of the Celestron telescope requires accurate temperature compensated focus. This is achieved using an Optec TCF-S3 focuser. 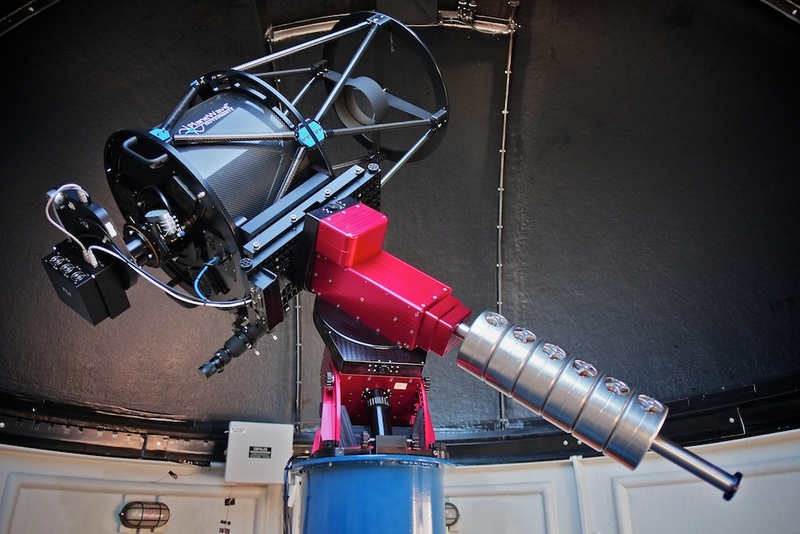 SPIRIT 2 is a 43cm Corrected Dall-Kirkham telescope manufactured by Planewave Instruments. Its imaging camera is a Fingerlakes Instruments ProLine PL16801, which provides a 40 arc minute square field of view, and a resolution of 0.63 arc seconds per pixel at bin 1. The thermally stable carbon-fibre truss design negates the need for temperature compensated focus. SPIRIT 3 has identical technical specifications to SPIRIT 1, providing a 20 arc minute square field of view, and a default resolution of 1.2 arc seconds per pixel. 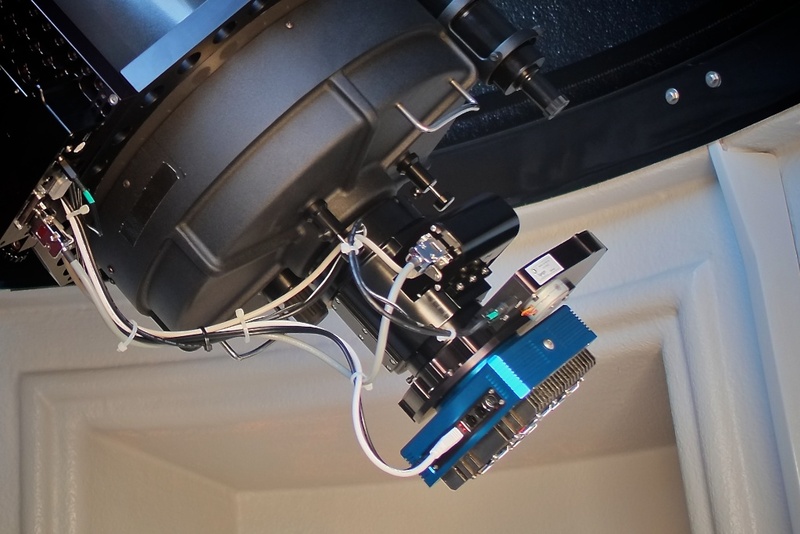 It utilises an SBIG-STL 1001E CCD camera. 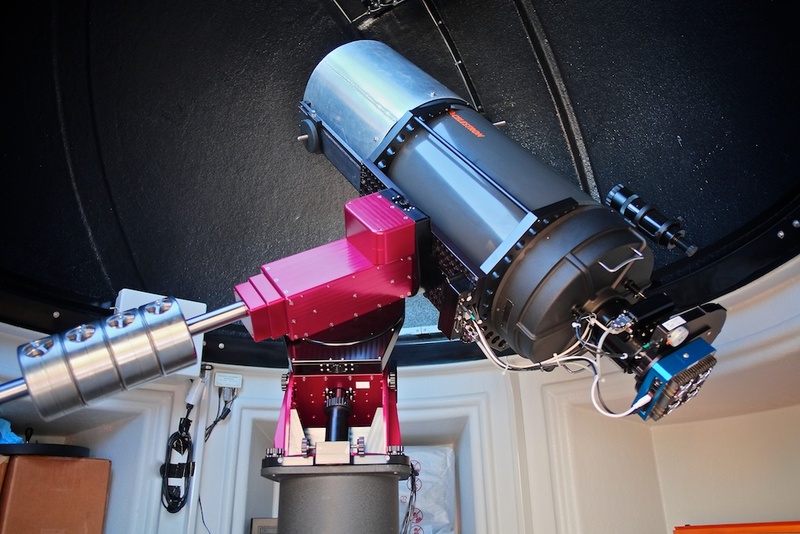 SPIRIT 4 is a 32cm Corrected Dall-Kirkham telescope manufactured by Planewave Instruments. Its imaging camera is an SBIG STX-16803 , offering a 50 arc minute field of view and a native resolution of 0.7 arc seconds per pixel. The Apogee camera on SPIRIT 1 uses a KAF-1001E sensor – a 1024 x 1024 array of 24μm size pixels. The FLI camera used on SPIRIT 2 uses a KAF-16801 sensor – a 4096 x 4096 array of 7.4μm size pixels. The SBIG camera on SPIRIT 3 uses a KAF-1001E sensor – a 1024 x 1024 array of 24μm size pixels. The SBIG camera on SPIRIT 4 uses a KAF-16803 sensor – a 4096 x 4096 array of 7.4μm size pixels. 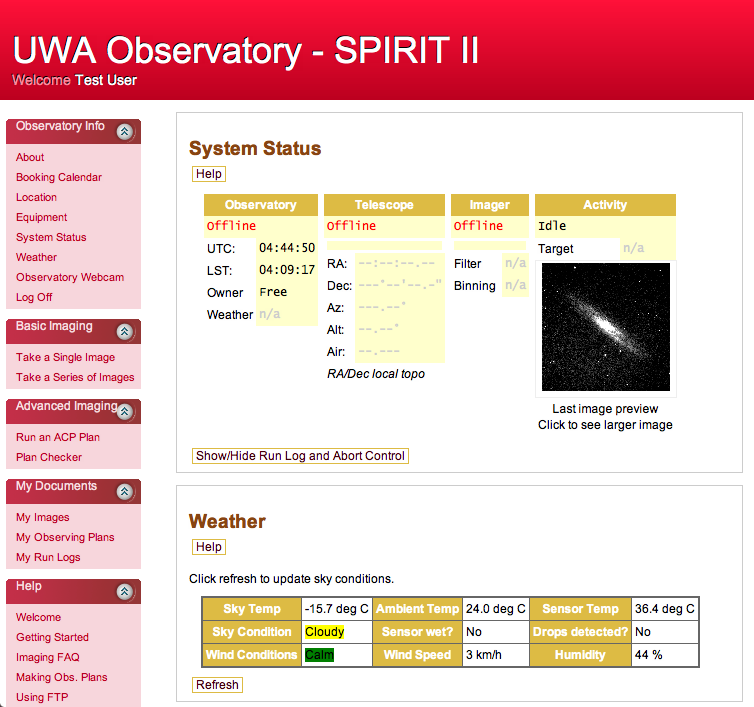 Under the light polluted skies of UWA, SPIRIT 1 is best used at its default bin mode of 1. 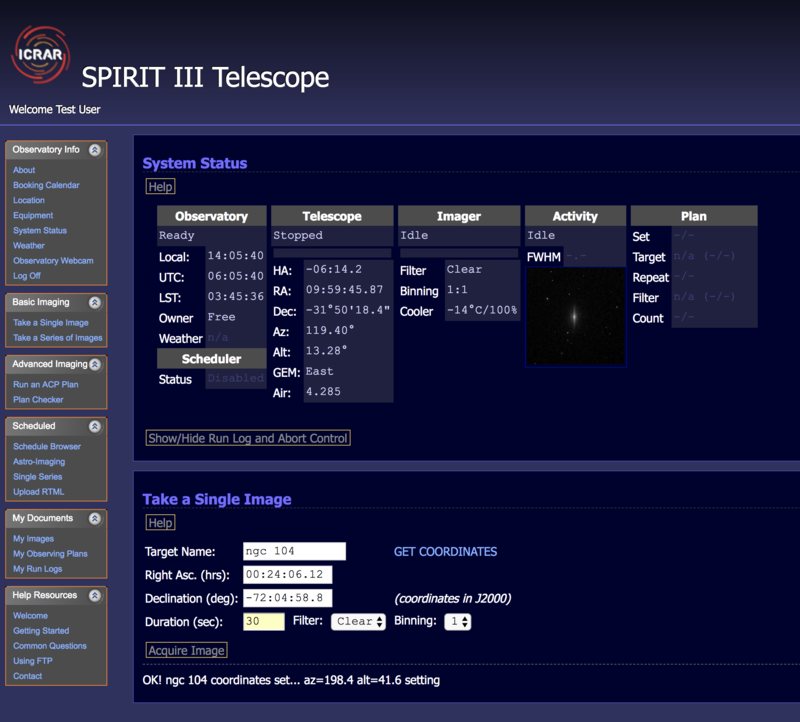 SPIRIT 2 operates optimally at the pre-defined default bin mode of 3 (1.8 arc seconds per pixel), however bin 2 (1.2 arc seconds per pixel) may provide better results for photometric and astrometric projects when the astronomical seeing is good. SPIRIT 1 and 2 image trains include software controlled filter wheels that provide access to photographic Red, Green and Blue filters, and photometric B, V, and R filters. Clear (non-IR blocked) filters are provided on both instruments for parfocal ‘non-filtered’ imaging. In addition, SPIRIT 1 includes a narrow band H-a (hydrogen-alpha) filter. 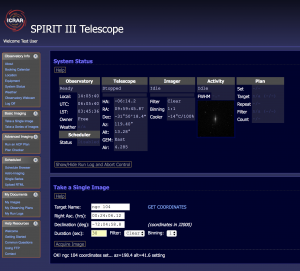 SPIRIT 2 includes a low resolution, web enabled bright star spectroscope. 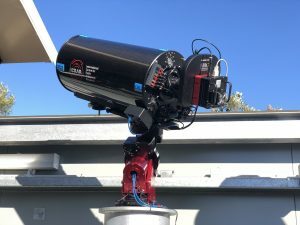 The ‘SPIRIT Bright Star Spectroscope’ is mounted to the top of SPIRIT 2 and comprises an 80mm refracting telescope, a 100 lines/mm transmission grating and a video camera. It produces a real time, low resolution spectral image of bright targets with a spectral dispersion of approximately 10 Angstroms per pixel. The entire spectral image—from ultraviolet to infrared—is contained on a single image taken by the camera. Images from the spectroscope are processed and presented as a spectral profile in real time. The spectral image can also be downloaded for calibration and analysis off-line. SPIRIT 3 & 4 are situated under the much darker skies at Gingin north of Perth. SPIRIT 3 operates at its native bin mode of 1, and SPIRIT 4 is best used at bin 2 (1.4 arc seconds per pixel). SPIRIT 3 provides Clear, B,V,R and I filters as a dedicated ‘photometric’ telescope, though colour images can still be created by mapping images taken through the R, V and B to the red, green and blue channels in processing software. SPIRIT 4 is a relatively wide field ‘astrograph’, offering photographic Red, Green and Blue filters together with a luminance (IR-blocked) filter for Clear imaging. It also includes a 5nm Ha filter. Accurate target positioning and tracking is achieved using the Paramount robotic telescope mount utilising advanced periodic error correction, pointing and tracking algorithms. As a consequence, the instruments do not use auto-guiders, although SPIRIT 4 incorporates an auto-guider for special applications. The limiting magnitude is constrained by varying sky conditions, with a practical exposure limit of 300 seconds for the UWA campus-based telescopes caused by the sky glow from light pollution. Even so, astrometric observations of minor planets approaching magnitude 19.5 are routinely undertaken using ‘stacking’ techniques. SPIRIT 1 & 2 are housed within observatory domes manufactured by Sirius Observatories, and are automated using the MaxDome interface manufactured by Diffraction Limited. Integrated weather monitoring using Boltwood cloud sensors protects equipment during the onset of poor weather. SPIRIT 3 & 4 are hosted within the Zadko roll off roof observatory that houses a number of telescopes, with weather and roof safety controlled by the Zadko Observatory system. Daily telescope functioning includes highly automated ‘dusk until dawn’ operations. Year-round remote access to the telescopes is provided 7 days a week (weather dependent) excluding maintenance periods and staff leave. All daily operations have been fully automated including CCD Camera initialisation (cooling), pre-dusk dome opening and pre-dawn dome closing procedures. Flat field frames are acquired automatically at dusk (weather dependent) using pre-defined positions and timing through all filters with bin modes dependent on the telescope. Fresh bias and dark frames are also acquired each night. Master calibration frames are created from several sub frames to ensure high quality image calibration for both scientific and astrophotographic applications. Images are calibrated automatically as part of the acquisition process. SPIRIT telescopes are accessed by students and teachers using a web-enabled interface. Imaging commences at the end of astronomical twilight, nominally a sun angle of -12°. Differing modes of operation provide a number ways to use the SPIRIT telescopes. Users can operate SPIRIT 1 & 2 in real time and take single images or series of images through various filters, examining exposures as they are acquired. More advanced users can upload a list of targets created using an application called ACP Planner, so that images can be acquired unattended. ACP plans make use of simple but powerful scripting, allowing advanced users to create and modify automated imaging plans using a text editor of their choice. This advanced mode of operation is suited to survey work or large data collection scenaria, where it is not feasible to monitor operations for extended periods or an entire night. SPIRIT 3 and 4 operate in scheduled mode, with users requesting images and monitoring operations via the same web-based interface used for SPIRIT 1 and 2. The web interface includes access to catalogue databases for Messier, NGC, PGC and IC objects as well as the major planets by name. This permits novice users to specify targets without knowledge of the celestial coordinates system. In a similar way, minor planet ephemerides are calculated by the system at the time of imaging for numbered minor planets. Celestial coordinates can be specified in the interface for all other targets. a high resolution JPEG image. Images and log files can be accessed and downloaded directly through the web interface. FTP access is also provided and recommended to streamline image downloada as well as provide access to log files, ACP plans and calibration frames. SPIRIT 4 is currently experiencing hardware problems and may not be operating for extended periods.